Longtime Newport design darling Angela Moore is trading the Ocean State for the Sunshine State, taking her corporate contingent to sunny Florida. The good news? Angela Moore’s Newport boutique on Bellevue will be business as usual and remain one of “the avenue’s” best loved boutiques. Even better? The crew wants to pack light so they’re kicking off a Spring Moving Sale today through Friday with clothing, totes and accessories. 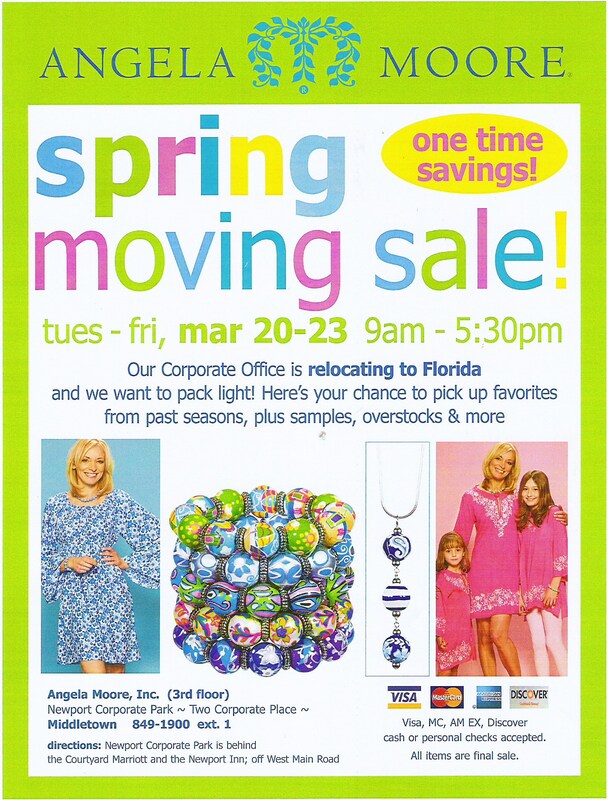 If you’re a sample sale seasoned pro, note the new sale location of the third floor of Angela Moore’s corporate headquarters (for the next few days at least) at Two Corporate Place in Middletown. Entry filed under: Uncategorized. Tags: Angela Moore, Angela Moore beaded bracklets, Angela Moore beaded jewelry, Angela Moore Bellevue Avenue, Angela Moore discount code, Angela Moore flip flops, Angela Moore moving sale, Angela Moore moving to florida, Angela Moore Newport Rhode Island, Angela Moore Palm Beach, Angela Moore sale, Angela Moore tunics, Angela Moore worth avenue, Angela Moore wraps, chef tattoos, mad men dress banana republic, new shops Newport rhode island.